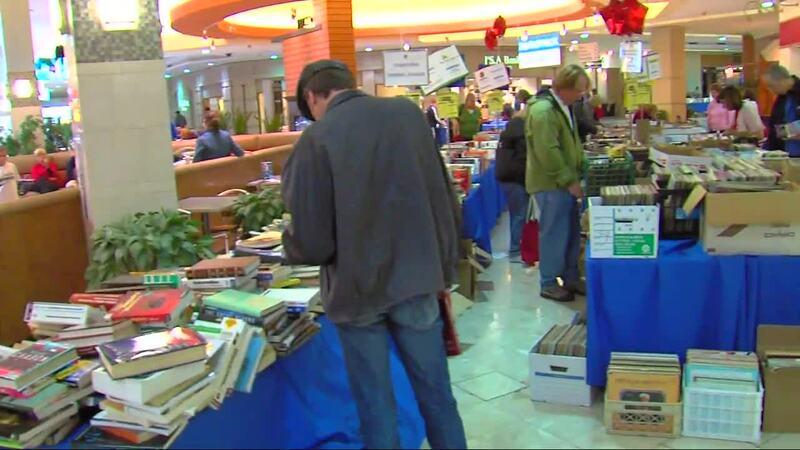 LIVONIA, MICH (WXYZ) — Bookstock is back, offering unbelievable deals on used books and media Sunday, April 7 through Sunday, April 14 at Livonia’s Laurel Park Place. Bargains abound at Bookstock, metro Detroit’s biggest and best used book and media sale, where proceeds benefit literacy and education projects throughout the City of Detroit and Oakland, Wayne, Benzie, Washtenaw and Grand Traverse Counties. Bookstock is forming a new partnership with JVS Human Services, which serves as the institutional home of Bookstock. Detroit News columnist Neal Rubin is Honorary Chairperson of Bookstock, and Alycia Meriweather, Deputy Superintendent of Detroit Public Schools Community District, is Bookstock's Honorary Chancellor. Bookstock 2019's Presenting Sponsor is the Mike Morse Law Firm. Bookstock’s Pre-Sale will kick-off on Sunday, April 7 at 8:15 a.m. with a performance by the Plymouth Fife and Drum Corps. There is a $20 admission charge for the Pre-Sale only, which runs through 11 a.m. and offers savvy shoppers and collectors first crack at Bookstock’s treasure trove of deals. Bookstock has 300,000-plus gently used books, DVDs, CDs, books on tape, and vinyl for sale at bargain basement prices. The sale will continue through Sunday, April 14, running Sundays,11 a.m. — 6 p.m. and Monday through Saturday 10 a.m. — 9 p.m. New stock is added to the floor daily. * Monday Madness – Monday, April 8: The first 2,000 shoppers will receive spectacular giveaways plus a chance to win a $100 VISA gift card every hour! * Teacher Appreciation Days – Tuesday, April 9 and Wednesday April 10: Bookstock is celebrating teachers by giving 50% off to all teachers with a valid ID from 3 — 9 p.m. on both days. On Tuesday at 5 p.m., the Bookstock B.E.S.T. Awards, (Bookstock Extraordinary Student/School/Teacher) will be given to fourth grade students from Detroit Public Schools Community District who write the top essays entitled, “My Favorite Book Character…and Why.” Bookstock 2019 Presenting Sponsor Mike Morse, Honorary Chairperson Neal Rubin and Honorary Chancellor Alycia Meriweather will present the awards live at Bookstock at 5:20 p.m., and cash prizes will be given to five students, their teachers and their schools. * Bookbuster Special Days – Thursday, April 11 and Friday, April 12: Buy three books and get the fourth book *free (*least expensive item) from 3 – 9 p.m.
* Cookstock – Saturday, April 13: Half price on the area's largest collection of used cookbooks plus incredible cooking and dining prizes given away throughout the day. * Half Price Finale, Sunday, April 29: All books and media will be sold for half price! Bookstock is brought to the community by a consortium of non-profit organizations that support education and literacy projects throughout metro Detroit. For more information about Bookstook, call the Bookstock hotline, (248) 645-7840, ext. 365, or visit https://www.bookstockmi.org/ . Laurel Park Place is located on 6 Mile Road east of I-275 in Livonia.